Canadian basketball player associated with the Phoenix Suns and Los Angeles Lakers. Official site and NBA gives this guy 6ft 3. On his twitter when asked how tall he was without shoes, he said "6'1". I saw Nash at footlocker when he played for santa clara. I was standing next to him picking shoes out before I knew it was him. I was startled at how small he was. I'm 5'9 and he didn't feel a lot bigger than me. 6 foot seems about right. 6'1 seem unrealistic. @Trevor M Then Jeremy Lin will be 6'0 1/4, Kobe Bryant 6'3 and Dwight Howard 6'7. 185cm at most. 6'0.75" would be the perfect guess. Nash might measure 6'1 at the doctor office since he wasn't drafted and get measure by the NBA official. 6'0 1/2 is the lowest i won't estimate below. @Canson I'd say your estimate of full 6'1" or a shade over our of bed is outstanding as well as slightly over 6'0" for an extreme low. He's looked anywhere from 184-186.5 honestly. Sometimes he seems 6'0 1/2- 6'1" other times 6'1- 6'1/2". But I think he'd likely fall under 6'1" a little in some pictures. 185cm more or less. My guess is 6'0 3/4". I'm guessing his 6'1" barefoot claim is early morning or out of bed. Legit full height just not the height used on this site as far as listings. My final guess is 185-186.17cm, a centimeter, comparable to Barack Obama. correction : realized have some cm's on him as well. I agree with what Junior said. He’s a strong 6’ perhaps or best case weak 6’1”. IMO Nash is being honest about 6ft1. Even from years ago he appeared shorter than players who are listed at 6ft3 such as Derrick Rose, and Stephen Curry. I swear these inflated guesses only exist for b-baller whose fans are adamant on believing their nba lists heights. @Junior: good insights as always! 6'0.5"-6'0 5/8 is more suitable for Nash. I think Trump is more like 6'0.25"-6'0 3/8 max next to 185cm Obama who don't look even a tip of mm over 185cm next to Kobe Bryant. Kobe is more possible measure 6'4 7/8 (6'4.875) range and just let his wife round down say 6'4.75" because most people get the .875 would just round up or round down the figure to 6'5 or 6ft4.75 or to give the 3/4. Thats what i figure out so far. I think Nash is honest about himself being 6ft1 in barefeet. I noticed this even in his prime because he looked significantly shorter than players like Jason Kidd, and Gary Payton. Since he had a rivalry with those two they probably billed him as 6ft3 to fit in. Nash can look only 6'0 with Kobe but look right 6'1 with Jeremy Lin. He looks like a weak 6'1 guy. Not sure he'd be 6'1 in the afternoon, probably more like 6'0½ or 6'0¾. He possibly can't be 186-187 when he's 11-12cm shorter than 195 Kobe Bryant. What are you gonna say next, that Kobe's 198-199? What is it with you that you wanna make almost every celebrity taller than they really are, yet you call them tw*ts when they inflate a couple inches themselves, like you did with Dwayne Johnson. I met Nash, he's a solid 6'2" without shoes. He's taller than you'd think and very thin and rangy. Nice guy with a kind of quiet voice in person. 184.5cm at early lunch time & 183.5cm at night or during activities. David beckham only look max 5'10 with kobe bryant and nash look max 2' taller than david beckham. Rob, how likely is 186cm? As a Lakers fan I can say with confidence that Steve Nash is between 5'11.75" and 6'0.25". Might have lost some height due to his back issues...was MAYBE 6'1.25" in the morning as a spry 21-22 year old. There's this vid, part two of the episode. I'll have to heck to see the exact time but I think it's halfway through. Anyway, it's the source of his 6ft2 claim. Oh, and he also said that growing up, he was always just "average, or above height" and so was always a guard. It's funny, as soon as him and Ron walked into the studio, the first thing that someone working there said to him was "man, I thought you'd be taller!". Nash replied "really?" With a bit of a smirk. I was watching iconoclasts this morning, and it featured Steve Nash and Ron Howard meeting each other. They're aren't many 6ft2, white point guards.". I think it's clear he's giving shoe height, though nonetheless it is interesting to have a claim from him. looks this listed height of 6'1 if not a fraction or a few millimeters under from the research I have done,but near enough so a good, fair and accurate listing once again Rob. One my fave PG's, btw. Steve Nash is about 6ft I believe. Chris Paul is 5'10. Chris Paul measured 5'11.75" barefoot actually. Most basketball players have 1-2 inches added on to their height, as people have been saying. Point guards tend to be a lot closer to average height then the heights they're listed as, but often still on the taller side by everyday standards. jay leno is about 5-10 and steve looks about an inch taller at best not counting his spikey hair . this will make him 5-11 . i just dont see him being 3 inches taller here than leno . what do you think rob ? Agreed Daniele. I think Harden might be around 6'4. I'm still not so sure about Jeremy Lin though. Kroc you may be right. The year Harden got drafted, measurements took place in the early morning so the reported height is his morning height. Anyway according to me he looks the same of Dwyane Wade. I'll say Steve Nash is a legit 6'1"
Some pics suggest that he's almost the same of Chris Paul. It's just unbelievable that a 6ft guy is listed at 6'3... He's definitely shorter than other players in 6'1-6'2 range like Rose, Irving and Deron Williams. Why did you list him 6'1 Rob? Rob, how tall is the average male american? I know I heard 5 ft 8 or 9, but on this site it seems like most of the males are taller than 6 ft. Are male celebs taller than the average male? I have stood very near I'm at a suns charities function. I am 6 ft. 3, and I am sure I was a bit taller. Shorter than Kaka by at least 2-3 cm. Proves he's 183-184 cm tops, it also proves Justin Timberfake is 178-179 cm tops. Looks about 2" shorter than 6'2" listed football (soccer) player Tom Huddlestone. Nash is no taller than 184/5cm max and only because we can't see their footwear - Huddlestone may be wearing football studs. Steve Nash is a solid 6'1"
he's 6 ft 0.75 in/185 cm like Cristiano Ronaldo while Kakà is 6 ft 1.25 in/186 cm. This is Chris Paul, he is listed as 5 '11.75 "
Cristiano is legit 6-1 and Kaka is maybe an inch taller so Kaka can be 6-2. Therfore, Nash 6-1 sounds right to me. If you guys watch the video below halfway through Nash talks about his height and brings a "normal sized guy" in. I will say this at 6'1" I consider Nash the start of solid tall he looks tall to me at all times. Hey Rob, just so you know and to all the other guys you can find a lot of player heights without shoes measurement on this web site as well. Yes, I think. Kaka in studs, but what about Nash's shoes can only be expected . 18 mm, which is the maximum permitted length of studs permitted by FIFA (but the length of the spikes may be less than 11 to 18 mm). And I do not think that Kaka is above 186 cm. I'd say they're the same. Kaka in studs and Nash in flat trainers? I've seen him claim "6'2 on a very good day." Kaka (186 cm) and Steve Nash (191 cm). Bdub, why did you say you measured your dad at night? did you sneak in on him and do it while he was sleeping? 186 Cm at most since I heard with my own ears him describing himself at 6'1 without shoes on an ESPN radio show. I just saw Steve Nash on the Sundance TV show Iconoclasts where he was on with Ron Howard. At one point, he spoke of himself as a "6-2 guy from Canada". I think he is rounding up. By the way, he was way taller than Ron Howard and they were both in athletic shoes. Matter of fact, I think RH had more heel on his shoes! Nash is taller than Sharapova, Click Here eye to eye, but he's same height 6'1.5/6'2". Sharapova looks taller than Nash in each picture when you consider Nash's camera advantage. Nash taller than Trump in a photo, maybe a solid 1'. Nash Measured 6'1 at 22, but now he's 6'1.5/6'2". Trump isnt 6-2 anymore. 6-2 measured Shawne Merriman has an inch on him on his myspace page. 6-1 measured Nash is the same height as Trump. Trump is 6-1 these days. I say Nash is 6'1.5". Definitely no shorter than 6'1"
Very likely. Seems like the NBA does add on the 2" rule. Nate Robinson clearly states in a Youtube video of his Top 10 dunks that "I'm only 5'7", but don't let the height fool you". My buddy was lucky enough to take a picture with him a couple years ago, and Nash was a clearly smaller then my friend who is 6'2 and change. I'd put him at about 6'1. I'm 6'1 and I've walked by him before and we're pretty close. He's probably 6 and a half to 6'1/5. "Nash is over 6'1, but not over 6'2 barefoot". Nash measured 6'1" prior to being drafted in 1996. Nash is over 6'1, but not over 6'2 barefoot. I remember seeing an old draft document from 1996 and it had him listed at 6'3 with 6'1 in brackets. It looked like this: 6'3 (6'1). I'm thinking the height in brackets was his barefoot height. Anyone just see the interview with Conan O'Brien where Conan ask him if he's 6'2", and he sayson a very, very good day? lol At least he was honest. He admits he is 6'1" in his interview on the Charlie Rose show. I stood next to him in a restaurant in Phoenix as we were waiting to be seated, and I easily had 3 inches on him (I am not quite 6'4"). More interesting is how skinny he is - not an ounce of fat on him - from behind he looks like a teenager. NBA doesnt really inflate they just usually list them in shoes, especially the guard. Keep in mind those sneakers give over an inch. Gonzalo, I've seen a lot of football players and almost everyone was a bit shorter than their listed height. Most accurate stats add players 2 cm, but sometimes they give even 5 cm more than they really have. Gonzalo, Nash was measured 6'1" without shoes at the 1996 pre-draft camp. I'd say that's most likely reliable while the other players listings are off by a little. this makes Tony Parker 6'0 right? What's w/ the NBA inflating heights? It's not like the players are short to begin with! To me, Henry and Nash are the same height in that pic, which makes sense, cos Henry has imo always been 6'1" and not the listed 6'2"
Nash looked as tall if not taller than Thierry Henry when he visited Fc Barcelona team in New York. Henry is listed everywhere at 1`88. Nash looking taller than Henry and Abidal. Abidal is listed 1`86. He was actually measured 6-1 flat. He was measured at 6-0.75 (184.5 cm) right before the 1996 NBA Draft. Even with basketball shoes on he is just over 6-2. I've seen him in Treviso in 2006 and he looked just an inch, maybe two taller than me (I'm 5-11). Sam Jackson is 6-1 these days. Nash is 6'1. At 59, Samuel L. Jackson could have easily lost an inch or even more of height. My friend is only 40 and has already lost 2 cm from his prime height. There is no way that Nash is 1.5" shorter than 6'2.5" Jackson. Even slightly slouching, Nash looks at least as tall as Jackson, but I'd give him 6'3" if he straighted out his posture next to Jackson. I think Nash should be upgraded to at least 6'2.5". Okay, now I am really confused. I just saw Steve Nash present an award with Samuel Jackson on the ESPY Awards. Nash was clearly an inch taller than Jackson, who is listed at 6'2.5" tall on this site. What gives? Nash was wearing normal dress shoes with no discernible lifts. I'm sure photos will be up on the internet shortly, but based on what I saw, Nash looked 6'3" tall. I can honestly say he is just above 6 feet tall.. i am just under and saw him out this weekend. i had heard he was 6-3 and said the same thing to my buddy. he disagreed and had me walk over and stand next to him. he said he was maybe an inch taller than me. that would make him about 6'1". i always noticed how much steve nash is shorter than most of the other nba players. Steve Nash is not 6 foot 3. I saw him in person in 1993 in Canada at the Canada Summer Games and he was 6 foot one almost. Unless he grew at age 19 and looks taller on TV, he is 6 foot and a half or 6'1". i would what nash's wingspan is? just curious? and yeah, it's kinda funny that the phoneix suns got two rather famous no-neck players...Shawn Marion and Amare Stoudimere....they both got virtually no neck-to-speak of which allows them to play taller than their listed heights in suppose. Wayne Gretzky was NOT 5'10. He wasn't 6' either. In his prime with Edmonton he playedagainst my beloved Winnipeg Jets and I hung around the locker rooms trying to meet him - everyone who did said he was about 5'11" - 5'11.5" in his socks. Because he was so slight compared to other players (175 - 180 lbs), he might have looked taller but he was never 6'. Where did you get 5'10", "in the morning"? Steve Nash is a legit 6'1 and more like 6'1 1/2 early in the morning. He can appear shorter on camera because he has a slighter physique than the average pro basketball player which makes him appear like a person of average height. Almost every NBA player is listed between 1-2 inches taller than their actual barefoot height. This is less noticable with the taller players because they have bigger feet and their shoes have thicker soles which help hide the gap. So basically, a 5'9 player who is listed at 5'11 will have a much more noticable difference of height inflation versus a player who is 6'6 and is listed at 6'8 simply because the 6'6 player has larger feet and wears shoes with soles about 1/2 to 2/3 of an inch thicker than the 5'9 player. Personally, I think a 6'2 NBA listing would of been better for Nash. Wayne Gretzky was alwyas listed at 6'0 by the NHL but was only 5'10 barefoot. Sager looks 6-3 max. 6-6 T-Mac has atleast 3-4 inches on him. Sager is 6'4.5" Nash was 6'1 at draft-camp in 96.
a post way below mentions Nash being 1-2 inches shorter than Craig Sager; I believe Sager is about 6-3 and maybe change, so that would verify Nash being 6-1.
he is exactly my height 6'1"
By the way allen4 Nash was measured 6'1" barefoot by the NBA. allen4 he looks 5'11" with Shaq because Shaq is 7'1" barefoot and 7'3" in shoes while Nash is 6'1" barefoot and probably 6'2" in shoes. Since Shaq's barefoot height is a foot above Nash's and then you factor in the additional inch advantage Shaq has in shoes then those heights make sense. The guy was measured at 6-1. Yeah and he doesn't look a hair over that. disagree with you people who say hes 6'1. I've taken a photo with him and i'm 6'2. He was taller than me, so most likely 6'3. 6' 1" sounds exactly right. The only way it could be 6' 3" is if he had big 2 inch shoes. Nash isn't 6'3", but 5'11" is way too low for him. 6'1" sounds fair. I watched the Suns vs. Pistons match up yestarday and when Steve Nash was guarding 6'3 Chauncy Billups, Steve Nash looked more like 5'11 next to him. No way is Steve Nash 6'3. If Marion is over 6'5" then that means Amare grew from the 6'8.5" he measured when he was drafted and I doubt that considering legit 7'1" Shaq towered over Amare by what looked like 5-6 inches. Marion is closer to 6'6". Amare Stoudemire was measured at 6'8 3/4" in 2002, but some say he grew. Shawn Marion is no 6'5", he is a legit 6'6" to 6'7" while Steve Nash is about 6'0" to 6'1" and Amare Stoudemire 6'8" to 6'9"
Steve Nash 6'1", Felipe Lopez 6'3", and Devin Harris 6'1 3/4"
Michael Finley is 6'5 3/4"
i met him before the suns-raptors game dec 5, 2007 and he was my height or slightly taller and im 6'1. He probably had bigger shoes on though, because he was game ready so I'd put him at 6'1 barefoot. Just saw a game with the 5'9 Nate Robinson guarding Steve Nash. If Steve was really 6'3, he would have TOWERED over Nate with a six inch difference. But he didn't, Nash only looked a few inches taller then Nate. Nash is still a great player. There is no way Dirk Nowitski is 6-10. He's 7 ft without shoes. Well maybe it was Kidd's dress shoes, but he looked big, bigger than 6'3. To be fair, I was a bit star struck and I didn't approach him and try to gauge eye level, just estimated the top of his head. Theodoros Plakadopoulos Maybe it was his shaved head making him appear taller also, but he sure seemed to have more way more than .75 inches on myself. Well maybe it was Kidd's dress shoes, but he looked big, bigger than 6'3. To be fair, I was a bit star struck and I didn't approch him and try to gauge eye level, just estamiated the top of his head. Maybe it was his shaved head making him appear taller also, but he sure seemed to have more way more than .75 inches on myself. Well that means nash is just short of 6'2". 6'2 3/4 is practically 6'3". AAAA- Kidd is a measured 6'2 3/4". Nash is indeed 6'1". There is no more than 2" between Kidd and Nash. Kidd is listed at 6'4 in many places and I have seen him up close (he lives in Saddle River NJ and his daughter is in a kids class at the gym I go to) He looked as legit 6'4 when I saw him, not padded. I saw Nash up real close one time and he is only 6'1. I had an inch on him. It kinda weird. I love Nash but I dont see how he can be 6'3''. He doesnt look like a 6'3'' kinda guy. He doesnt have the frame for it. I have lots of friends who are 6'3'' and their legs are not as short as Nash (no offense). I would say that Nash is about 6'0'' to 6'1'' is the most. He just doesnt look like 6'3'' to me. looks about 6-1 to me. harris is 6 foot 2 and steve nash is taller. i agree with NBA.com that he is 6 foot 3. Nash isnt 6-0. He might look like that sometimes but hes a legit 6-1. Kidd is a little over an inch shorter than his listed height. Kenyon is only marginally under his listed height. The NBA never lists people as 6'8 3/4", so they round up. So Kidd is 6'3 and Kenyon Martin is 6'9? Kidd isn't much shorter than his listed height than. Ronanldinho is actually 5'9 3/4th. They use the 5'11 when he has his soccer cleats on. J-Dog, Kidd is 6'2 3/4" and Martin is 6'8 3/4". Kenyon uses his barefoot height. I saw Steve at a bar and stood right next to him, I'm 5'10 and he look about 6'1/6'2 tops. Steve Nash is probably a bit over 6'2" but I am not saying I even have a clue on his height as I haven't studied it enough. You guys are forgetting I think the average NBA height is 6'6" I think Viper knows the real number, most guys who are 6'4" and below are going to look "small" near these guys. Jason Kidd is 6'4" but if you look at him on the court near 6'9" Kenyon Martin he looks like a 6' player at times. I stood next to Nash last year at a charity event. We both had casual shoes on and he was definitely taller than me, but not by much. I just measured myself, and I'm right at 6 feet, 1 & 3/4 inches. I'd say he's 6'2" - 6'2.5"
Nash looked the same height as 6'3" Cheryl Miller the other night on TNT. Miller's height could be exaggerated of course. I though he was dead 6'. He always seems like a small dude on th court. I'll give him 6'1" maybe, but definitely no more than that. Phil- Even a legit 6'3" guy will look short next to guys that are at least 6'6"-6'7". I have a bro that is around 6 ft 2 or 3. And I"m only 5 ft 10 1/2. I found out that Steve Nash (My favorite player) was 6 ft 2 or 3, I flipped! He looks tiny on TV, but in reality... He's taller than me! hey have ne of you guys who sed he's shorter ever considered the fact that you(personally) don't know the difference between someone 6'0 and 6'3. firstly u CANNOT estimate someone's height without standing next to them or seeing them compared to someone else. also i'm sure he is measured accurately opposed to you who prolly do it at home or some s*** like dat. di man 6'3 leave it at that! eva considered you might be taller than you think? 6'1 plus basketball shoes=about 6'2.5 then rounded up you get 6'3. Thats how he is listed at 6'3. like a legit 6-3 guy. How tall is Dirk Nowitzski? Around 7'0"? Can't tell at all though in this pic though, because Dirk is leaning a lot, but it's a cool picture! I'm looking at a photo of Steve Nash and Kobe Bryant standing nose to nose shouting at each other during their April 26, 2006 playoff game. The photo is by Paul Connors of the AP, and was published in April 27th Sports sections around the country, including the Seattle Post-Intelligencer. Their noses are about 8" apart, and in the photo they look about the same height, with Kobe maybe slightly taller. Nash's eyes are actually higher than Kobe's, but Kobe is leaning forward a little more than Nash. Kobe Bryant is listed as 6' 6" or 6'7". There's no way Steve Nash is shorter than 6'3'', unless you think Kobe is shorter than 6'3". stand beside him for quite a long time at his charity bball game in vancouver. My comment makes no sense, I must have not been paying attention. What I meant was he looked to be 6'2 1/2" with shoes and probably 6'1 1/2" without shoes. I met and had a picture taken with Steve Nash before a round two playoff game. It was pre warm up and he had on regular athletic shoes, not basketball, and appeared to be 5 1/2 inches taller than me. Putting him at around 6'1/2". So, I would assume without shoes he's about 6' 1/2" feet tall. 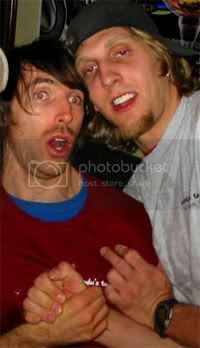 this is in 2005 and he's standing next to basketball player steve nash. he looks a lot shorter than Nash, who people say is 6-1.
well, Bill Walton has been around tall people people for a long time and he always goes overboard with his commentary. So I doubt he mistakes 6'1 for 5'11 but I don't know for sure. I'll have to look at more pictures. Monty, Tony Parker's not 6'2. Even Bill Walton said he was closer to 5'll. Steve Nash never looked 6'3 even though I do think he is at least 6'0. Ozzy: Where's your source on Ridnour's pre-draft measurement.. I cant seem to find it. Again, using gettyimages as a source, there is a pic of nash and luke ridnour standing next to each other in a portrait shot. both are standing up straight. ridnour measured 6'1/185cm w/o shoes at the pre-draft camp and nash is visibly taller. I have nash at 187cm (6'1.75). Again, I met Steve Nash and IN HIS BASKETBALL SHOES he is 6'3". 6'1" and you have to give him proper respect for being able to play in a giants game. The man is no where near 6'3". To be honest, 6' is pushing it a little. He may not even be 6'. Perhaps he did so jokingly.. (but there were no smiles or laughs) but Mike Greenberg referred to Steve Nash as being 5'9" on their radio show 5/1/06 at about 8AM EST. He was making reference to a Luke Walton/Steve Nash jump ball. JT he's nowhere close to 6'3"
If Finley is LISTED at a playing height (w/ shoes) of 6'7.. do you really think Nash is a legit 6'3? He's struggling with 6'0"
Saw Nash last night with Craig Sager on TNT. Nash looked about 6'2" or 6'3" next to Sager, who's around 6'4" or 6'5". Steve Nash is 6'3''? What's next? Allen Iverson is 6'2''? Tony Parker and Ridnour are well under their listed heights.. I've heard two professional eyewitnesses say nash was 6'0 even. Finley is about 6'6 barefoot. (6'7 listing).. He EASILY has 6" on Nash. Nash is 6'1 MAX... 6' is likely I do believe. Steve Nash is 6'3. Look at the pics below. Here he is with his coach Mike D'Antoni whos 6'3 and both are in sneakers. When D'Antoni is in his dress shoes during games he seems an inch taller then Nash. Heres Steve next to Luke Ridnour whos 6'2. And finally heres Nash and Aaron Carter whos unbeliveably listed at 6'0.5. There are many more pics which shows Nash is around 6'3 so Rob please increase his height. PS: Also Rob after seeing the pic with Aaron Carter can you add him to the database. More suprised with 6'9 Jamison in this pic. Yes I know he is standing a bit back, but still? Finley is 6'7ish WITH shoes.. so you figure out what Nash is barefoot. ON average, basketball players are like 6'5"-6'7" but Steve Nash is definitely 6'3"
Nash was listed at 188cm (6-2) at the 98 WC in Greece. The same listings had Magloire at 208cm (6-10), not 6-11. (See also the Jordan and Iverson forums). Nba players' heights are all over the place. I have worked for many summer camps at my university's gym and some players match their listed height and some don't. Never met Nash but he does look way shorter than 6'3. I know that both Quentin Richardson and Richard Hamilton are about 2" shorter than their listed height but Desmond Mason of the Bucks was around 2" taller. He was w/ the sonics when I met him and would say he's close to 6'7. He's listed as 6'5 but towered over me and I'm 6'3 even. I don't understand overlisting a player's height...it doesn't make you play taller. My school's point guard last year, Joe Sea is listed 6' and is more around 5'9. Guess Mr. Amir was right. http://www.ibiblio.org/craig/draft/1996_draft/draft/22.html look at the bottom of the page were it says STEVE NASH. The article states that NAsh was 6'1" when he got measured for the draft instead of 6'3"
[Editor Rob: thank you my son, here is the quote for prosperity sake: "He looked very good in the predraft camps, other than measuring in at only 6'1"
They are measured with shoes on. Nash is only about 6', maybe a little over.. I'm not sure why the Editor didnt knock him down more based on the picture posted before. He doesnt "quite look like" 6'1.5" barefoot either. This guy isn't even 6'1.